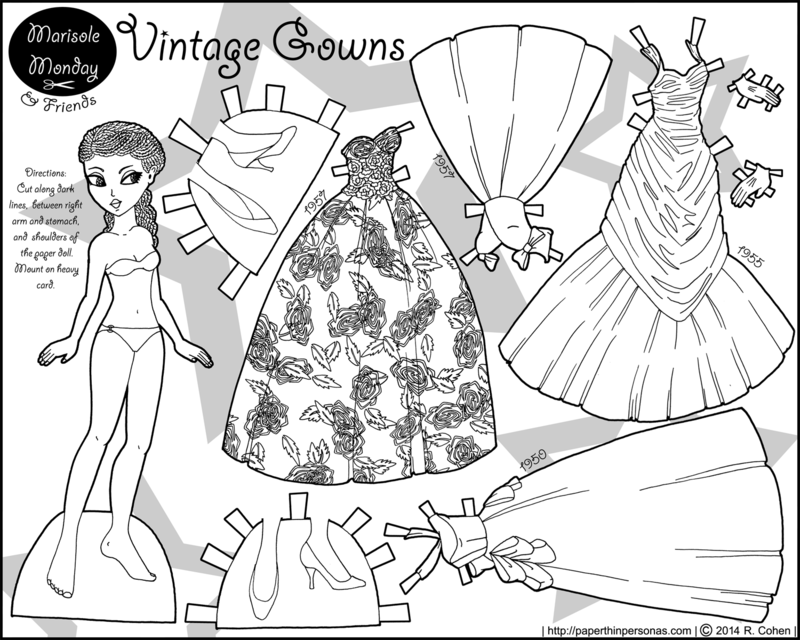 Nearly a year ago, I was asked to draw a paper doll of 1950s evening gowns. Initially, I didn’t do it, because I couldn’t find any 1950’s evening gowns that I liked. Eventually I felt guilty enough to check out the V&A and the Met, both have strong collections from the 1950s. By the way, in a totally unrelated note, that floral pattern on the full skirted gown was the most complicated floral pattern I have ever done. I’ll rant more about coloring next week when I post the colored version. All I have to say is that normally, a paper doll takes me four to six hours to color, layout and get set up for blog. This paper doll… took longer. Much Longer. I will talk about the sources for each gown next week when I post it in color. Also, my little drawing/contest is open until midnight on the 15th. Feel free to enter. Thank you, Natalie. I’m so glad you like them. loving the patterned dress! cant wait to see it in full color!